Discover Ouro Preto during your price guaranteed Brazil vacation. All of our Brazil tours have daily departures and are fully customizable. The city of Ouro Preto (“black gold” in Portuguese) was founded and built when a black-hued gold was found in this area in 1698. The discovery provoked a gold rush, and within 50 years the region had drawn over 110,000 residents. In the 18th century about 500,000 kilos of gold were excavated from the mines surrounding the city and shipped back to Portugal. The heavy work was done by slaves. A number of gold-ornamented churches were built in Ouro Preto during its golden boom, while wealthy residents constructed beautiful houses in the colonial baroque style. The gold age was over by the end of the 18th century, and as the mines dried out many people left the city. Due to its declining economic importance in the past century, no modern office buildings sprouted in its center, as they have in many other Brazilian cities. 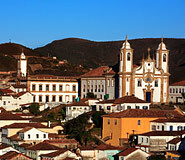 Ouro Preto was made a national monument in1933 and put under the protection of UNESCO in 1981. Ouro Preto is a top Brazil destination not only because it is aesthetically one of the best-preserved colonial towns, but also because of the weight of its significance in the country’s history. Its previous standing as a gold mining center has left behind many reminders of a more prosperous era, drawing visitors back into a fascinating 18th century atmosphere. The town is quite small and thus very manageable to get around on foot. A stroll along the hilly, cobblestoned streets is sure to help the inquisitive travelers garner appreciation for Ouro Preto’s old architectural secrets. Praça Tiradentes is the beating heart of the town, flanked on the southern side by the elegant Museu da Inconfidência. The museum holds many fine pieces of art and historical works. 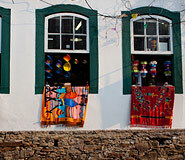 Many other museums in Ouro Preto also recall its mining past. The Museu de Mineralogia e das Pedras displays more than 23,000 precious stones from around the world. Thirteen beautiful churches exemplify the historic and present religious dedication of the populace. Visitors on an Ouro Preto vacation may also experience what mining life was like over 200 years ago. A tour through the Chico Rei Mine, one of the largest and most popular in the region, gives some insight into the tedious and dark work environment and is outfitted with an attached restaurant. The Passagem Mines of 1719, on the other hand, give a more thrilling adventure, requiring you to wade through an underground lake at one point. 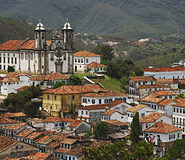 Nearby excursions from Ouro Preto include Itacolomi State Park and the town of Mariana. It is compulsory to have a guide for the park, who will introduce to you the large variety of plants and animals that call it home. There is even an 8 mile (12 kilometer) trekking path that includes sights of picturesque villages and waterfalls along the way. Mariana, just 10.5 miles (18 kilometers) from Ouro Preto, is the oldest city in the state of Minas Gerais and offers a slightly different colonial feel than its neighbor. A steam-powered train restored most recently in 2006 runs close by, offering stunning landscape views of this precious corner of Brazil. Ouro Preto fills up during Carnival and is very popular destination among Brazilian tourists. Accommodation is scarce during this period. Climatologically, Ouro Preto can be visited the whole year, although nights can be pretty chilly in winter months – Ouro Preto is at about 1100 meters above sea level. We recommend spending at least two days in the area in order to be able to see the most interesting sights and absorb the atmosphere. The highlight of the trip was the excursion to Iguazu. It is spectacular and amazingly beautiful. I recommend it toeverybody.